This bundle focuses on supporting your KM interventions. The Method Cards cover 80 possible approaches methods and tools, and the Guidebook gives you in-depth guidance on 24 of those. All at an attractive bundle price. 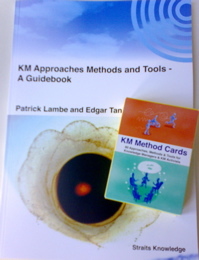 Our KM Method Cards and Guidebook bundle is available for online purchase at USD105 (including package and posting). This is a savings of USD10 over buying them separately!